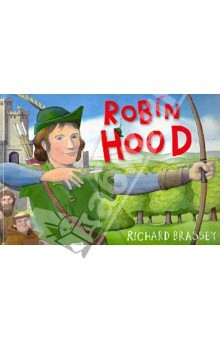 Robin Hood Orion Explore the myth behind the man in this fun and fascinating full-colour book. From medieval times to the modern day, people have been fascinated by tales of the famous outlaw who allegedly robbed the rich to give to the poor. But who was Robin Hood really - aristocrat or commoner, hero or villain? Myths abound and in this book, with all the humour and affection of the bestselling NESSIE, Richard Brassey gently pokes fun at the falsehoods while pursuing the truth. Аннотация к книге "Robin Hood"
Explore the myth behind the man in this fun and fascinating full-colour book. From medieval times to the modern day, people have been fascinated by tales of the famous outlaw who allegedly robbed the rich to give to the poor. But who was Robin Hood really - aristocrat or commoner, hero or villain? Myths abound and in this book, with all the humour and affection of the bestselling NESSIE, Richard Brassey gently pokes fun at the falsehoods while pursuing the truth. –27 % Выгода 120 ₽ Peppa Goes Swimming 2 рец. Peppa Dress-Up. Sticker Book 3 рец. Если вы обнаружили ошибку в описании книги "Robin Hood" (автор Richard Brassey), пишите об этом в сообщении об ошибке. Спасибо!